Horsepower and torque are terms normally heard in auto and truck commercials as both are used to measure a vehicle’s performance on the road. But how are these words connected, really? This article seeks explain how. Horsepower is a measurement of power; that is, the measurement of the rate at which work is done. The term was first used by James Watt, a Scottish engineer and inventor of the steam engine. He wanted to compare the power output of steam engines with that of draft horses as it was the amount energy people were familiar with at the time. It then became a standard measurement for the power output of engines and other machines. Watts came up with the idea that 1 horsepower is equal to a horse pulling a 330-lb load at a pace of 100 feet per minute; thus, 1 horsepower is equal to 33,000 foot-lbs. Later on, it expanded to cover the power produced by piston engines, electric motors, turbines, and various pieces of machinery. 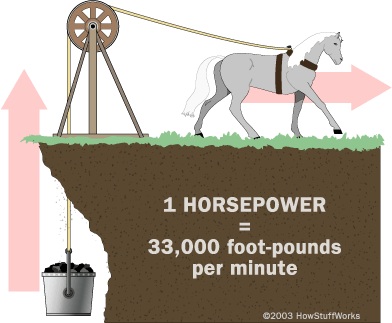 In exact mathematical terms, one horsepower is the amount of work required to move 550 lbs one foot in one second. A human is capable of maintaining about 0.1 horsepower while a small motor has an output of 10 horsepower. A jet engine is capable of generating 1,000 horsepower. There are various standards and types of horsepower, and the two most commonly used are mechanical horsepower (i.e. imperial horsepower) and metric horsepower. Mechanical horsepower is equivalent to about 745.7 watts and was previously defined as equal to 550 foot-pounds per second. Metric horsepower is equivalent to about 735.5 watts and was originally defined as 75 kilogram-force per second. Torque is the measure of the rotational force of an object such as a wheel or a bolt. 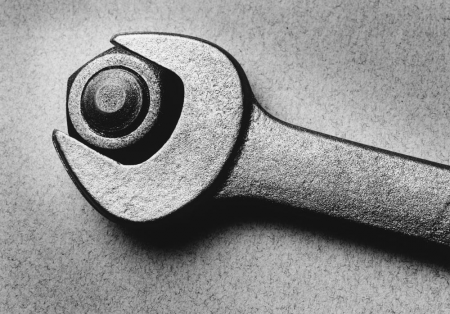 Turning the handle of a wrench locked on a nut or bolt generates a torque that either tightens or loosens the bolt. There are various measurement for torque and in the US, torque is measured by pounds-feet or lb-ft. A straightforward calculation of torque involves the amount of power required to turn a foot long wrench to tighten a bolt. The length of the wrench affects the number of pounds required to move the bolt. Typically, the longer the length of the wrench, the fewer pounds needed to turn the bolt. So what’s the difference between horsepower and torque? Horsepower is a measurement of power; that is, the amount of work is done while torque is the measurement of the rotational force of an object. Horsepower is described as being equal to torque multiplied by RPM (rotation per minute) divided by 5,252 while torque is determined by multiplying horsepower by 5,252 divided by RPM. This is evidenced by the horsepower and torque graphs always meeting at 5,252 RPM. Horsepower is related to the ability of an engine to keep a heavier object in motion at a constant speed. Torque is related to the engine’s ability to pull large loads from a standstill.